I'm feeling rather seedy. No, not that type of seedy. 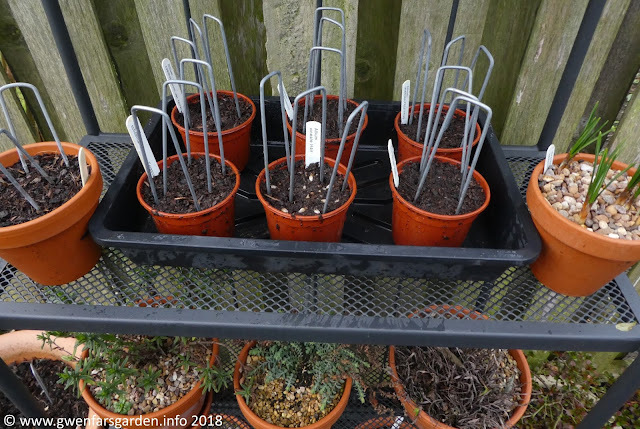 The growing seeds type of seedy. 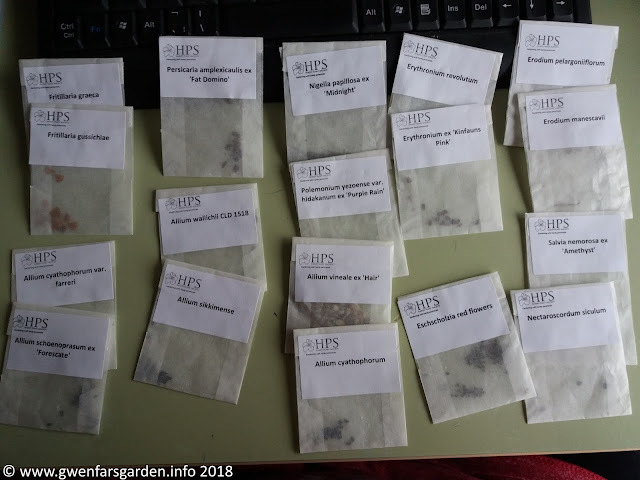 This week the seeds I ordered from the annual Hardy Plant Society (HPS) Seed Distribution Scheme, arrived. As a member, for only £5 (to cover the costs of postage and admin), I can order 20 packets of seeds. You can see the different types of seeds I ordered above. 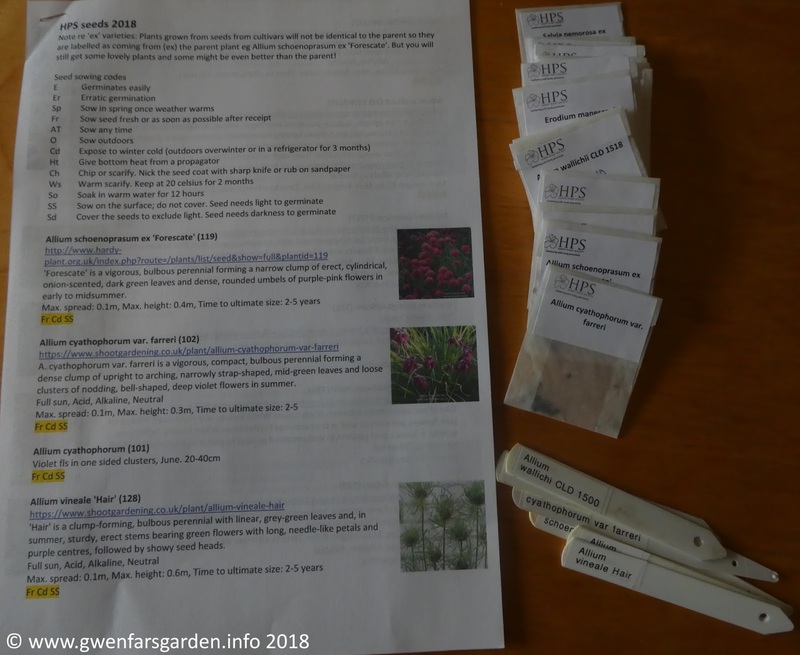 I looked each variety up so I had the correct growing information and collated all of this into a document, along with a picture (where I could find them) so it will be easier for me to identify. Yes, I'm that nerdy. From finding out this information, I discovered that I needed to sow all the Allium seeds immediately. So I also made up labels for them. It was then seed sowing time. They need light to germinate, so I didn't cover the seeds with anything. I felt like I should have done so, as you do that with most seeds. But HPS said you don't, so I have followed their advice. And because they need cold to help them germinate, I've put them on a display shelf in the garden. The ground staples (the silver prongs) are there to stop the pigeons from getting in there an digging up the seed. Yes, they do that, and I've found this is effective in stopping them. Once the plants get to a certain size, I can remove the staples. The rest of my seeds are to be sown in Spring. Wow, you are so organised, I am very impressed. Can you do mine for me too?! 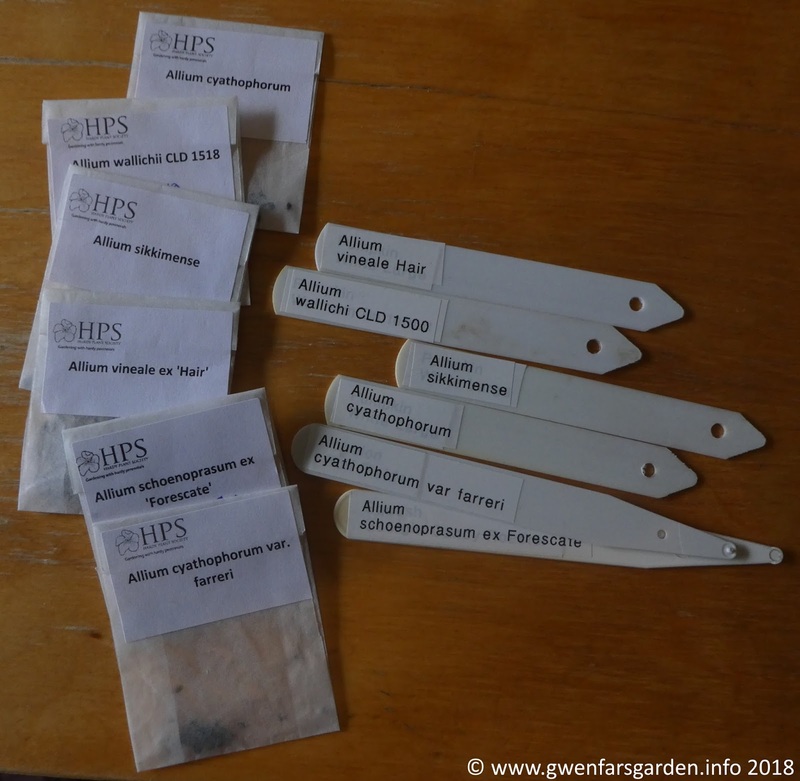 ;) Good luck, looking forward to seeing them all germinate. I agree,its the way to go & treat each seed as so precious you want to get the most out of it. No chance of forgetting or mixing up the pots now! Our seeds arrived too but nothing as special as yours. Being organised is certainly not nerdy! The staples are a good idea. I'm sure your seeds are special too. Exciting isn't it. 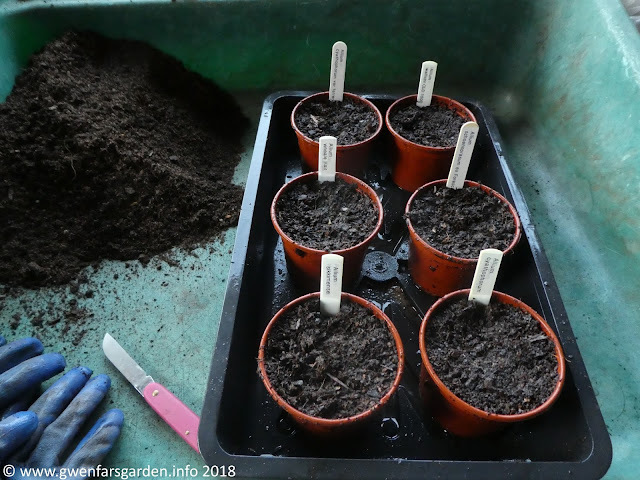 I've done the same with my seeds from the RHS. Some of the pots are in the fridge which hasn't made me popular but at least the birds can't get at them there! True, it will. It can be a real faff to sort labels when you are sowing. It's good to do it when it's winter and I cannot sow!